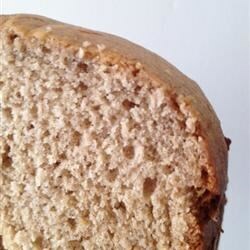 "A quick and delicious bread for bread machines. The applesauce makes it nice and moist without having to add any butter or shortening." Place ingredients in the pan of the bread machine in the order recommended by the manufacturer. Select cycle; press Start. Let the dough mix for 3 to 5 minutes, until all ingredients are thoroughly combined. If necessary, use a rubber spatula to push the dough from the sides of the bread pan. After 3 to 5 minutes have passed on the clock display, press Stop. Smooth out the top of the loaf with the rubber spatula. Select Bake setting and press Start. To test the bread for doneness, insert a toothpick into the center top. Remove the toothpick. If the bread is done, the toothpick will come out clean. If there is dough on the toothpick, reset the machine to Bake and continue an additional 10 to 15 minutes. Test again with toothpick to assure the bread is completely baked. Remove the pan from the machine but allow the bread to remain in the pan for 10 minutes before removing the bread and placing on a wire rack to cool. this recipe is very good and easy to make. i made mine without a bread maker, just pop it in the oven for 50 min on 350. thanks! I added some yeast and more flour and it turned out fine. Kinda dense...but I fear it would not have risen if I didn't add those things. Family loved the taste. This recipe tastes great and is super easy! It could be a little more moist though. Delicious..and easy. My two boys, ages 2 and 3 even loved it, especially warm!! The applesauce makes it very moist.